A local clean air campaigner became embroiled in a social media row with Hackney’s Mayor this week following her calls for road closure plans in Stoke Newington to be abandoned during a speech at a rally for children’s charity Unicef. Jenna Fansa, in her role as a campaigner for CleanAir4Schools (CA4S), was invited to address a 100-strong crowd at Unicef’s Clean Air Action Day event in Marble Arch. The charity held rallies in London, Birmingham and Manchester on 16 March to “show how strongly local children, families and campaigners feel about the urgent issue of toxic air”. Fansa told the crowd: “I’m here today because when my little boy runs around in his school playground, he’s inhaling toxic air. “When I push my two-year-old in her buggy tiny particles are entering her lungs that could be causing irreparable damage. 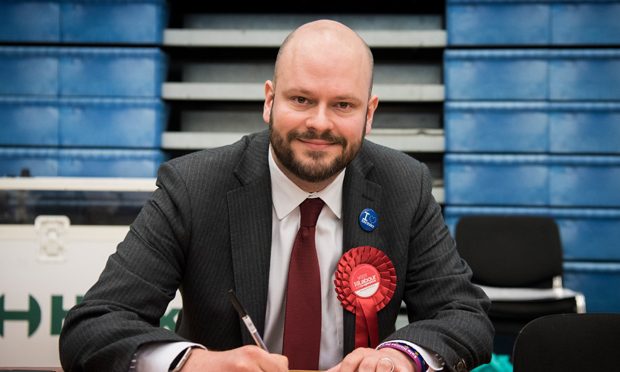 CA4S and Hackney Council have been at loggerheads for more than a year over the latter’s plans to close a number of back roads in Stoke Newington. 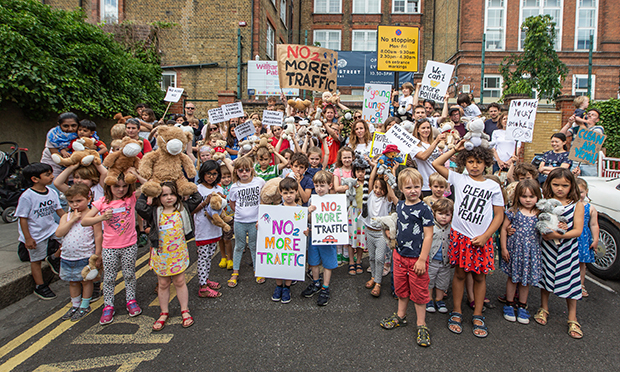 Campaigners say the move will lead to an increase in pollution on the nearby high street – home to William Patten primary, one of the most polluted schools in the capital. Sixty local businesses recently signed a petition calling for the plans to be scrapped. The Town Hall is soon expected to release updated traffic and air quality analysis after clean air experts and parents raised concerns over the estimates produced for the road closure consultation, which closed in January 2018. The sides are also in dispute over which air quality limits apply in school playgrounds, and the council recently admitted “human error” had led to incorrect monitoring figures – although it made clear that it relies on different, more thorough data in its policy-making. Fansa continued her speech by saying: “My six-year-old goes to one of London’s 50 most polluted schools. “Last year air quality experts for the Mayor of London visited his school in Hackney. “They could have said reduce traffic outside or move the bus stop so hundreds of buses no longer spew toxic fumes into the playground. She praised the Mayor of London’s incoming Ultra Low Emission Zone (ULEZ) and the fact that buses are going green, but called for “more change, and faster”. Fansa later tweeted about the event from her account @StokeyParents, the local family network she founded, copying in Mayor of Hackney Philip Glanville, who responded: “I’m sure you provided a very balanced speech that covered all the work the council is doing to cut pollution in Hackney and hailed it as one of biggest interveners to tackle poor quality air in London. I’m sure you provided a very balanced speech that covered all the work the Council is doing to cut pollution in Hackney and hailed it as one of biggest interveners to tackle poor quality air in London. As well as at the cutting edge of fighting the #ClimateEmergency & plastics. She then accused the Mayor of using the row as an opportunity to tweet about the council’s work rather than to support some of “your youngest residents […] voicing their concerns”. Fansa finished by saying: “These kids are five years old. Their eyes would glass over if you try to talk Hackney policy. So you didn’t have a chance? Sad to miss the chance to talkabout: school streets, active travel plans, ULEV streets, support for ULEZ, diesel CPZ surcharge, cleaner fleet, filtering, liveable n’bourhoods, investment in cycling & walking, the ZENs, parklets, more EV charging etc. Unicef research last year found that children are most at risk from pollution when in and around school. 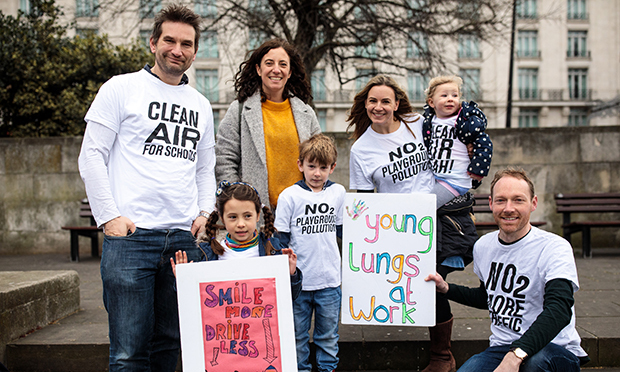 Following the 16 March action day, Unicef UK’s campaigns manager Becky Dallison said: “Currently around one third of children across the UK are breathing in illegal levels of air pollution and this figure rises to around 75 per cent in the cities we have demonstrated in.